A Teaching System Developed over 50 Years of Playing, Teaching, Coaching, and Sharing the Great Game of Golf. If you are just taking up the game, shaking off the rust after time away or are getting ready for a big tournament, David will get you where you want to go. Do you have a small group ready to learn? David can run a custom class for you and your friends. Parent's give your kids the gift of golf! Learn to Play class is designed as a first step into playing the game of golf. Class held weekly at Goat Hill Park and taught by David Emerick, PGA. Boys and girls ages 6-10 should start with this class as it meets weekly! This 1.5 hour class is just right for boys and girls who have some golf experience and want to improve their playing skills! The Swing ~ Score ~ Play method spends time on all parts of the game and we always play a few holes as a team! Girls class meets on Mondays and Boys class meets on Thursdays from 3:30-5:00. Congrats to The Goat Hill Junior PGA Team! What a great season. Never too early to start planning for next year. Click here for Junior Instruction and Programs. Learn About David's Home Course, Oceanside's Goat Hill Park. Coach Dave is on the grass range or on the course at Goat Hill Park giving golf lessons six days at week to men, women and children in private lessons, golf camps and clincs for all levels from beginner to tournament players. David's SWING ~SCORE~ PLAY~ System to lower scores! LEARN THE GAME AS IT IS PLAYED! Golf instruction starts with the basics of learning the GPA of golf, grip, posture, and alignments. But sadly many beginning golfers try to get the ball in the air and that can lead to many long lasting issues. Through the years we have learned in order to lower your scores your practice should be spent on Swinging ~ Scoring ~ Playing! That is why I have come up with a system to actually improve your handicap! Swing - your swing will be developed over time but your will learn how to move and create a swinging motion. Score - scoring revolves around putting, chipping, and pitching so important to learn the proper feel and mechanics of short game shots. Playing - yes playing why spend time on practicing without playing! David can tell by watching only a few swings how well you will consistently make solid contact with the ball, and where improvements can be made. 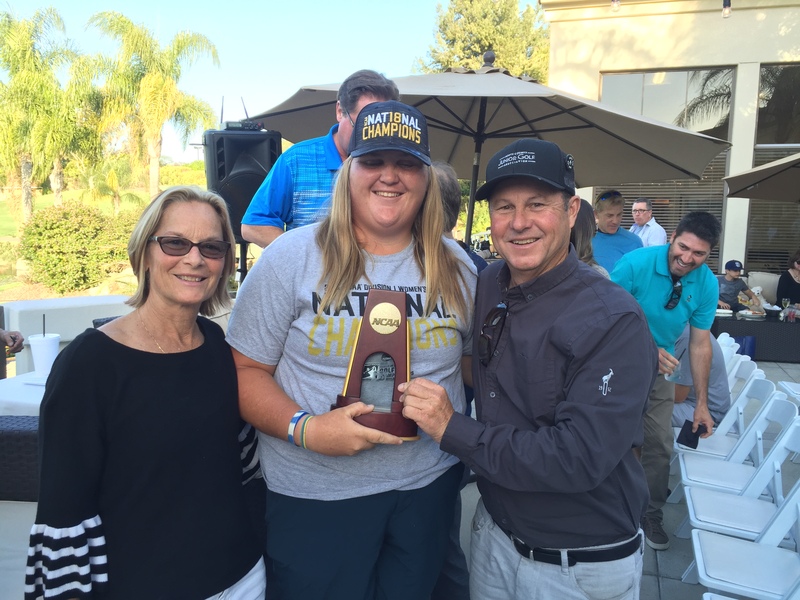 David and Marcia with Haley Moore - she learned GPA at an early age and look national champions!